Innovation Cluster, Breakfast Series, Inspires both Discussion & Insight! 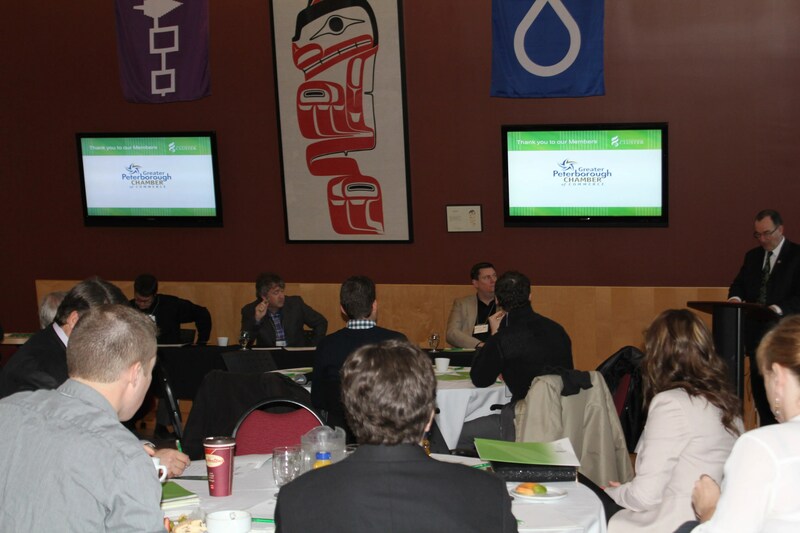 The Greater Peterborough Innovation Cluster (GPIC) hosted their Quarterly Breakfast Series, in partnership with The Greater Peterborough Chamber of Commerce (GPCC), Friday, January 18th, The Gathering Space, in Gzowski College at Trent University. The Breakfast Series is sponsored by Bereskin & Parr LLP and a number of community partners. This event highlighted the topic of commercialization, focusing on marketing, supply chain/distribution and sales customer support, provided by a panel of creative and accomplished individuals from the Peterborough area. Paul Hickey, partner & President of BrandHealth, discussed how to develop effective marketing for your organization, and how this augments the commercialization/sales process, in a dynamic and interactive presentation. Adam Doran, VP of Marketing and Sales for Aclarus Ozone Water Systems, touched on the importance of developing an efficient supply chain and how this effects the commercialization/sale process; relating it to his own company Aclarus. The final presenter of the morning, Mike Skinner, General Manager of OpenText gave an insightful presentation on how to develop effective company wide, customer support. The Greater Peterborough Innovation Cluster and Greater Peterborough Chamber of Commerce, is hosting the “Quarterly Breakfast Series,” Friday January 18th, 2013, at The Gathering Space, Gzowski College, Trent University – 7:30 – 9:30 a.m. Presented by Bereskin & Parr Intellectual Property LLP. This event will highlight the topic of commercialization, focusing on marketing, supply chain/distribution and sales customer support. The Innovation Cluster is happy to announce Paul Hickey, partner & President of BrandHealth. Mr. Hickey will be discussing, how marketing can impact commercialization and sales. For more information on Paul Hickey read his bio posted below. Paul was born and raised in Peterborough, and graduated from Queen’s University in 1987 with a Bachelor of Commerce degree. He was co-founder of MarketForce, which by the late 90’s had grown into Canada’s leading healthcare and pharmaceutical advertising agency. Paul and his two partners sold MarketForce to Young & Rubicam (New York) in 1999, and Paul remained with the agency for four years during its biggest growth phase. Paul retired from MarketForce in 2003, and then returned to the advertising world in 2005 by starting a new agency, BrandHealth, based in downtown Peterborough. From its Peterborough headquarters the agency provides strategic and creative services to some of the world’s leading healthcare and consumer brands including Botox®, Cialis® and Sensodyne® and now employs more than 30 full-time advertising professionals. He is currently Chair of the Board of Lakefield College School. Recent board involvement includes 4th Line Theatre, The Pharmaceutical Advertising Advisory Board (PAAB), and the Greater Peterborough Innovation Cluster. Paul is Past-Chair of the Association of Medical Advertising Agencies of Canada (AMAA). Paul, wife Kristine, and two daughters split their time between their homes in Millbrook, Ontario and Rustico, PEI.